- sept: Tutor Master Social Design at the Design Academy Eindhoven. Introducing students into the world of new technologies and bio-fabrication. 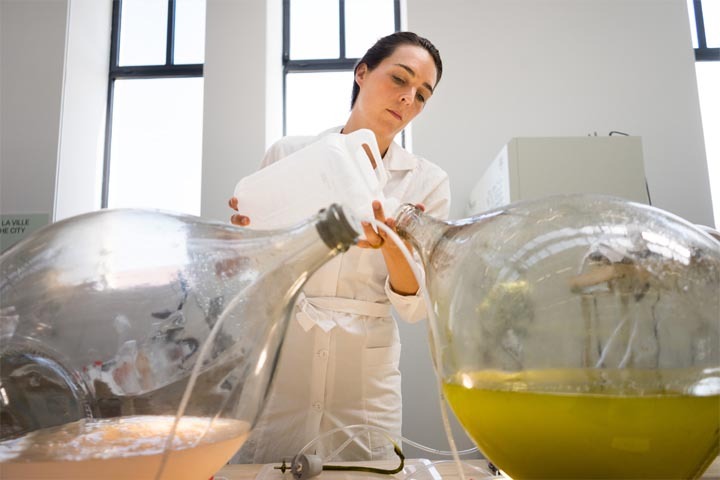 Algae Lab is located at the site of LUMA, and is focusing on the wetland specific bio-based material in order to come to new value propositions. 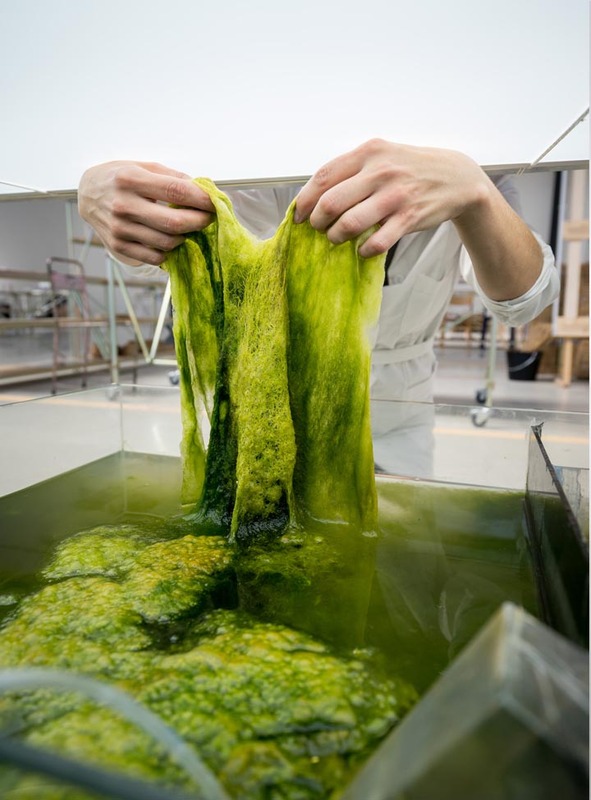 In particular, Studio Klarenbeek & Dros research the potential of algae as an alternative for non-biodegradable plastics. The development of a polymer from algae can be used to grow and create consumables and innovative products. The serie of objects are related to the culture and history of the region, as utensils from the depot of Musee Departemental Arles Antique. The objects should be conceived to serve the needs of various users and consumers of the museum and region. The laboratory displays the production chain so the visitor can experience the whole cycle of production from the raw material to the final product. 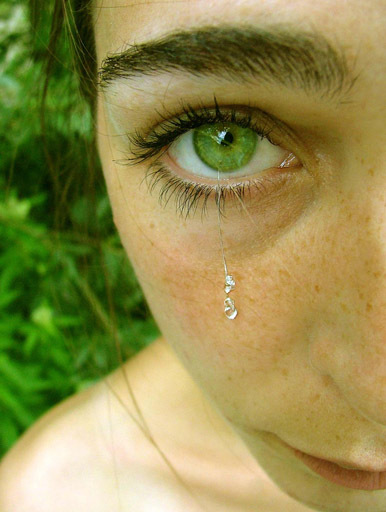 'In our research, we are concerned with binding carbon to biomass and converting algae into a biopolymer. Some algae produce starch as a waste product. Instead of using potatoes as a biopolymer, which is at the expense of our food and land, you can cultivate a macroalga [seaweed] in the sea. As it grows, it filters the seawater, absorbing co2 and producing a starch that can be used as a raw material for bioplastics or binding agents. After three years of research with Salga Seaweeds, Danvos, Wageningen University, the Biobased Lab in Breda and other institutions, we were invited to establish an open research and production lab at the luma Foundation in Arles. Here, since February 2017, we have tested alternative production in an urban setting. The co2 emissions and pollution from factories at the mouth of the Rhone are filtered by algae. 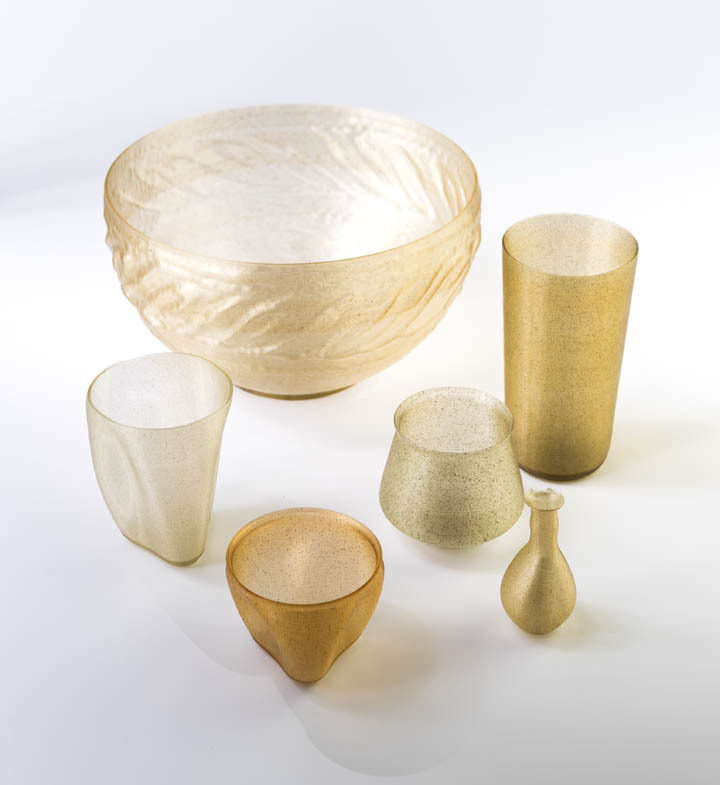 The by-product is a biomass that is not edible but is perfect for us as product designers. Usually the scientific community asks a multinational to associate itself with the research results, but then everything suddenly goes very slowly and after the first setback things grind to a halt. By contrast, we work very quickly, we are flexible and can set up a small-scale workplace. We are attempting to build a bridge between scientific research and the local economy. 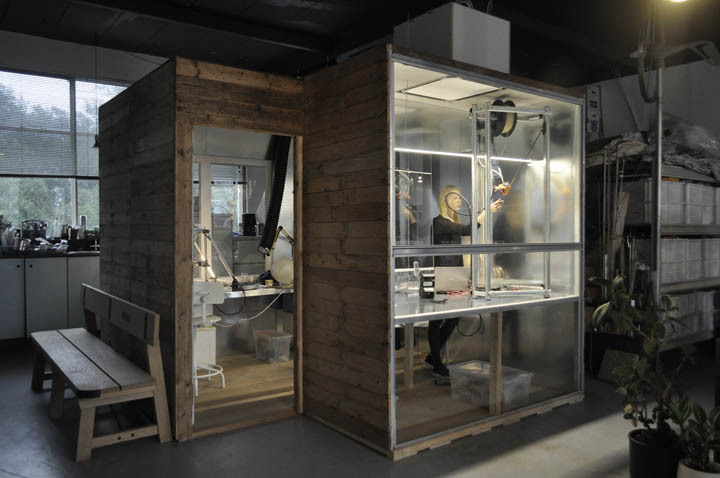 Algae Lab is part of atelier LUMA, a non-profit program that sets out to actively experiment with design and creative intelligence, in rethinking more ecologically sound and regionally embedded forms of production. The work begins in Arles and the Camargue. Through publications and conferences of a comprehensive set of design-based research, projects shall evolve through knowledge partners; and a plethora of interconnected design/business/research shall spawn new relations and new ways of working. Studio Klarenbeek & Dros are the first in the world who have 3D-printed living mycelium, a technology we are developing since 2011, and is now a startup KROWN, www.krown-design.com Combining the threadlike network of fungi with local raw materials, enables us to create products with a negative carbon footprint. 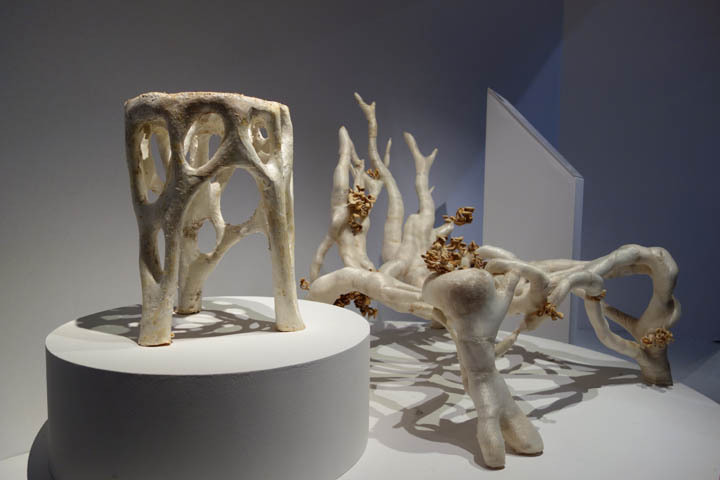 Studio Klarenbeek and Dros are exploring ways of 3D-printing living organisms, such as mycelium, the threadlike network of fungi, in combination with local raw materials to create products with a negative carbon footprint. 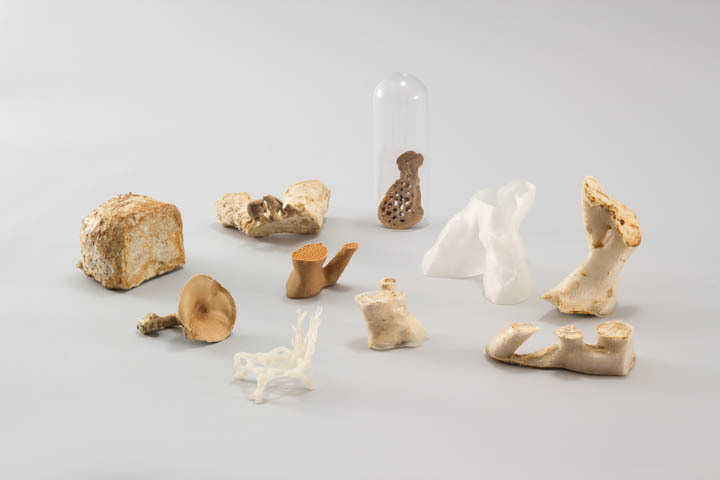 'We are the first in the world to 3D-print living mycelium, using this infinite natural source of organisms as living glue for binding organic waste. 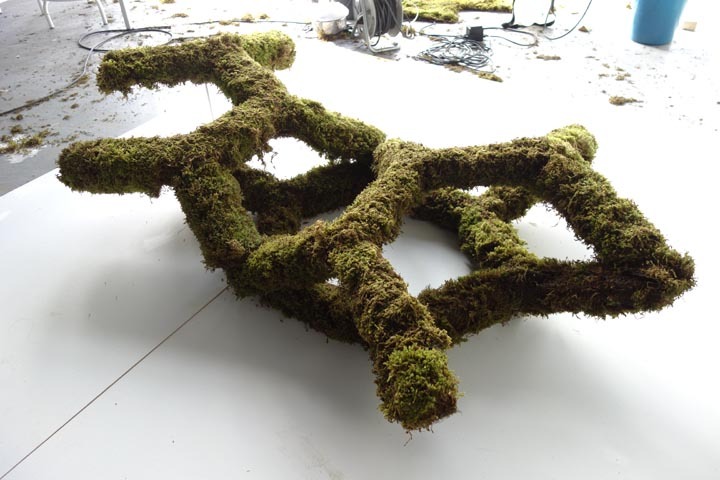 Once it's full-grown and dried, it turns into a structural, stable and renewable material. 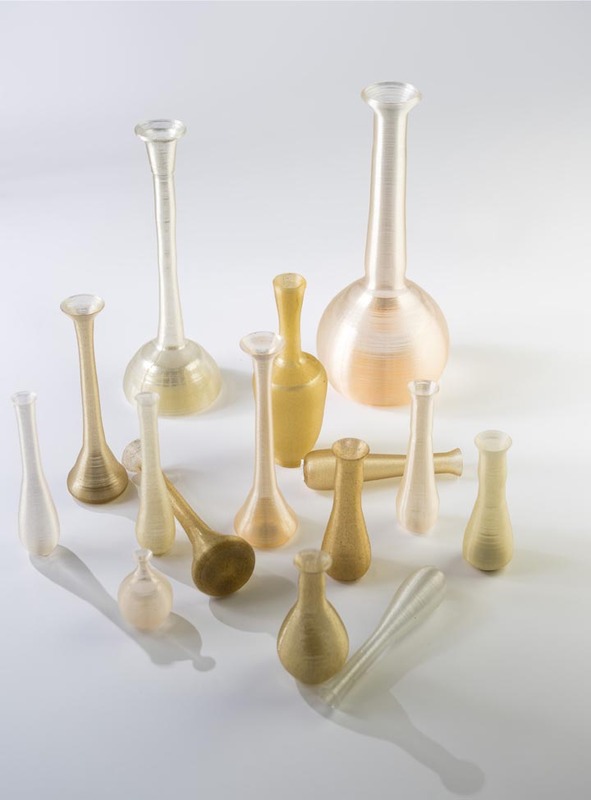 Combined with 3D-printing it gives us tremendous design freedom', says Eric Klarenbeek. 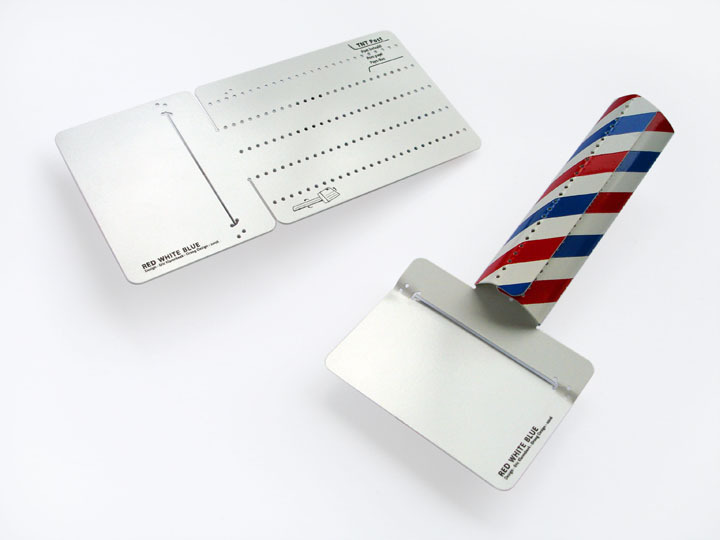 Most of our surrounding products are created through intensive industrial processes. We're imprisoned in this chain of waste, both in material fabrication as well as the negative effect on our surroundings due to transportation of these materials and goods. 3D-printing just partly provides in a solution, since we can produce locally by connecting nearby 'Makers' through existing web portals. 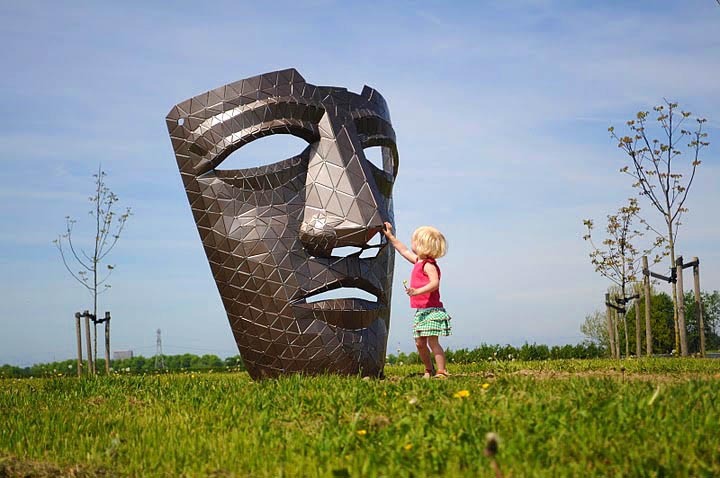 In the Netherlands for example, the available Maker network with 3D-printers is so dense, you can upload a design, and collect it by bike once its finished. The problem is the applied materials, which are mostly oil based plastics, and industrially produced. The same goes up for 'bioplastics', which also deal with other issues, such as the use of GMO's. Worldwide there are little producers of filaments, resulting in extensive transportation. Secondly there is little attention for the working conditions of Makers, as the printers have no filters and are mostly applied in unventilated spaces. This can cause serious health risks, especially if you consider actual ingredients are kept secret. As this market is relatively young, the time is now to introduce new possibilities and hand out alternatives. We've searched for ways to use local resources, and implementing growth in the fabrication process. 3D-printers work by gradually melting and layering plastics. Instead of using plastics, we pile up local land-waste, and the mycelium binds it all together. The machine simultaneously prints the infill and outer shell, which prevents its fresh mycelium and straw mixture from falling apart. After printing, we only have to wait for the structure to grow and gain its strength, which only takes a few days. This technology can be applied in a broad spectrum of applications. 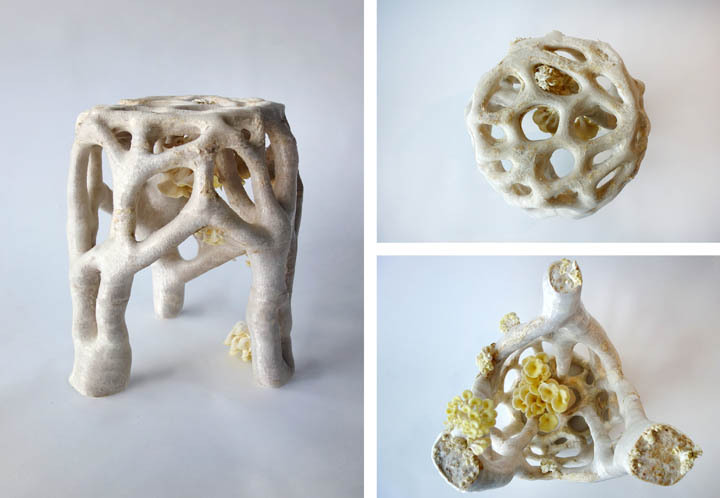 We started with the 'Mycelium Chair' as the archetype for a functional design object. 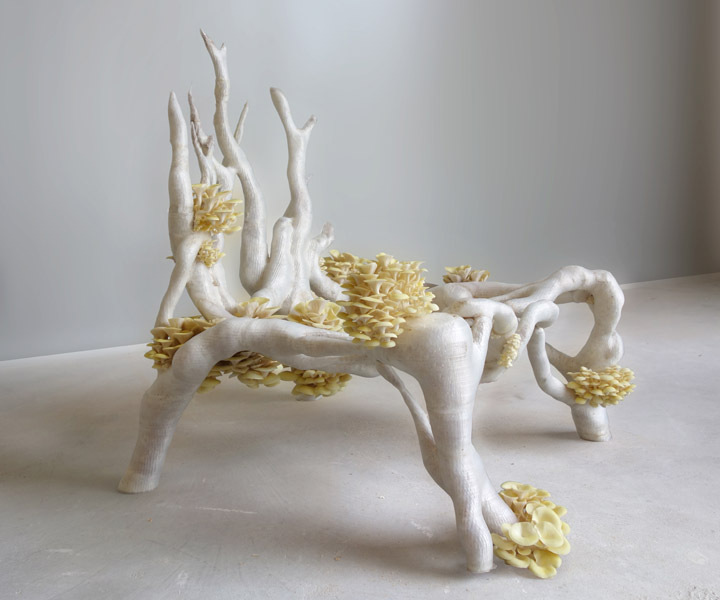 Form-wise the chair is inspired by growth and reflects the unimaginable freedom of 3D printing. The popping out mushrooms are both aesthetic and a 'proof of concept' as you can clearly see the mycelium has successfully grown through its whole structure. 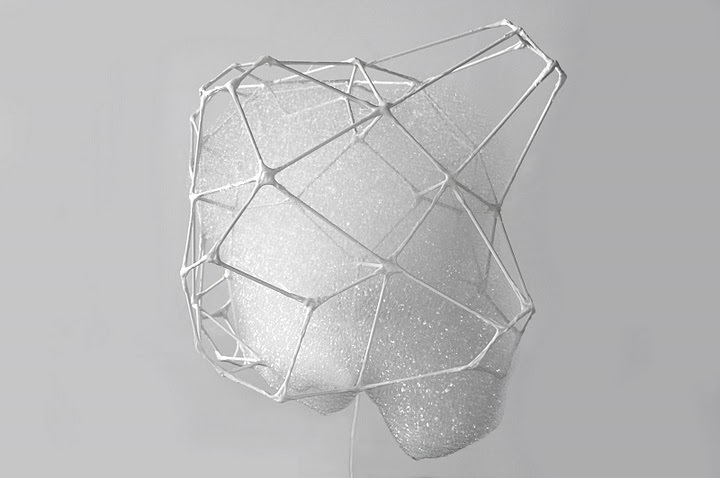 'Veiled Lady', Mycelium Project 2.0, is printed in one go and inspired by the net structure of its equally named fungus. As we've controlled the growth of mushrooms, they're not in conflict with its function as stool, and hidden as jewelry within its structure. At the moment we're working on a bigger printer for large-scale objects and on improved material properties. The plant material produces oxygen during its life cycle, and our production process eliminates the necessity of heating materials in the printing process, thus reducing the use of energy. Adding up those two facts, combined with the use of local resources and production, it becomes possible to create products with a negative 'carbon footprint'. Instead of wasting less, we strive to absorb emission. After use, the product is fully compostable, and can be disposed without harming the environment. On the contrary, it will fertilize our surroundings! 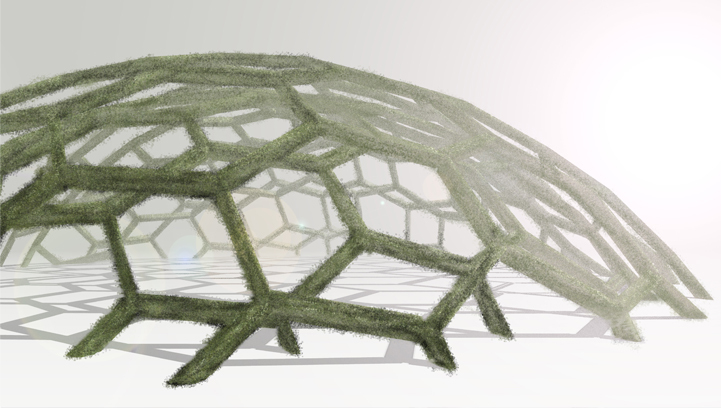 Mycelium, The Plastic of the future. Documentary about the global initiatives on Mycelium, by VICE, Motherboard. Mos als fijnstofvreters langs de N65, de rijksweg tussen 's-Hertogenbosch en Tilburg. 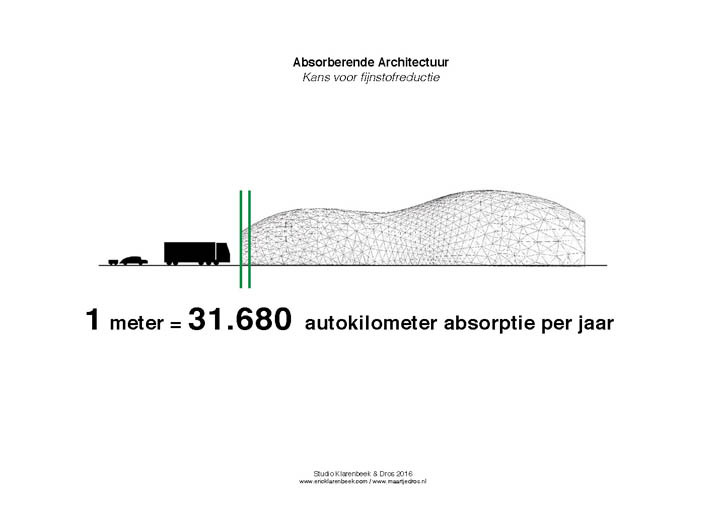 Studio Klarenbeek & Dros werkt samen met Kwekerij Aad Vermeer en de cooperatie Greentings aan architectonische ingrepen op en rondom de N65 die ervoor zorgen dat er een reductie van CO2 en fijnstof langs de weg plaatsvindt. De 'absorberende' architectuur is opgebouwd uit panelen en kaders met een poreuze structuur waar licht en lucht doorheen kan. Het geheel fungeert als een filter en is de beeldende basis voor de groei van bijvoorbeeld mos. 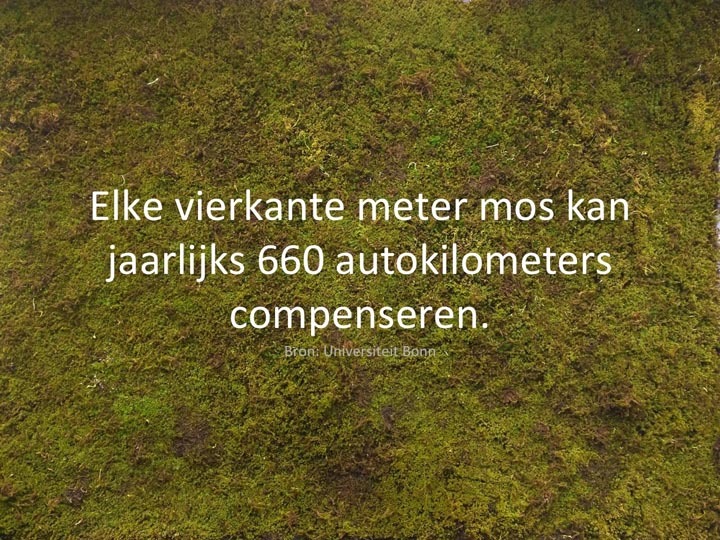 Hiermee ontwikkelen ze multifunctionele plekken zoals een overspanning voor een verkeersader of een bushalte langs de N65 als beschutting tegen fijnstof. Vanuit groene innovatie definiëren Klarenbeek en Dros een nieuwe identiteit en kwaliteiten van het gebied. De ontwerpers doen al langer onderzoek naar de absorptie van fijnstof door middel van organismen. De modellen die tot op heden zijn getest, blijken gering effect te hebben. 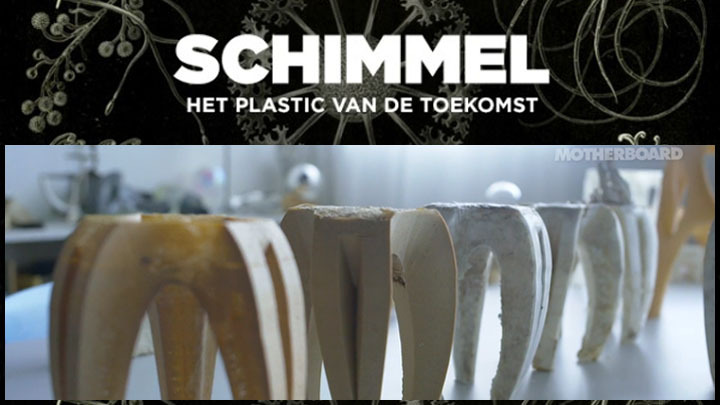 Met dit project willen zij via alternatieve experimenten, nieuwe benaderingen en methodes bekijken of een wezenlijk effect kan worden bereikt. Door absorptie vanuit het extreme te benaderen doen zij een poging te komen tot een model voor Nederland, maar ook daarbuiten [Publiek gemaakt], [BKKC]. 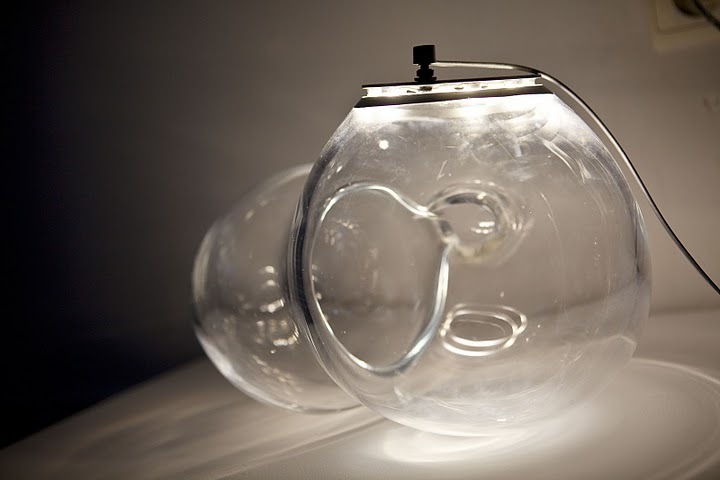 Eric Klarenbeek is tutor at the master Social Design at the Design Academy Eindhoven. 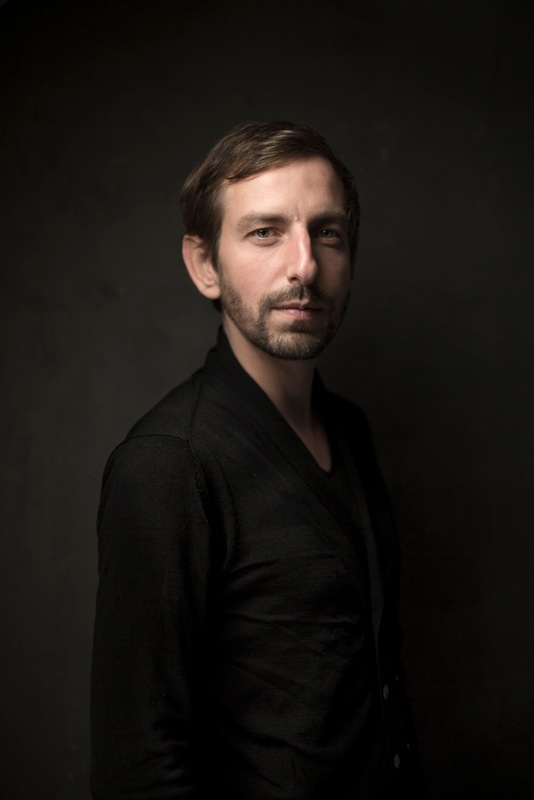 Tutor at the master of Architecture and Urbanism in Tilburg and founder of the ArTechLab at the ArtEZ Academy, a multidisciplinary research lab, established in the AKI ArtEZ Academy. 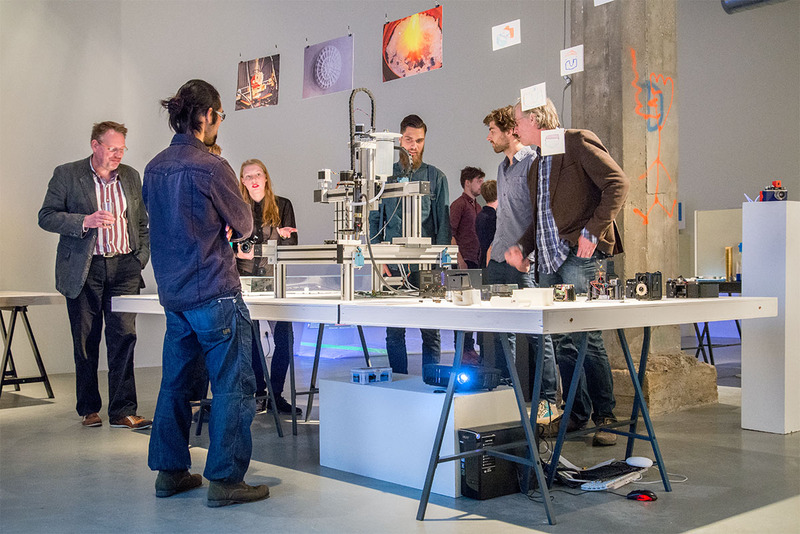 Founded in 2012, the ArTechLab guides art, design and science students in executing both applied and experimental research. 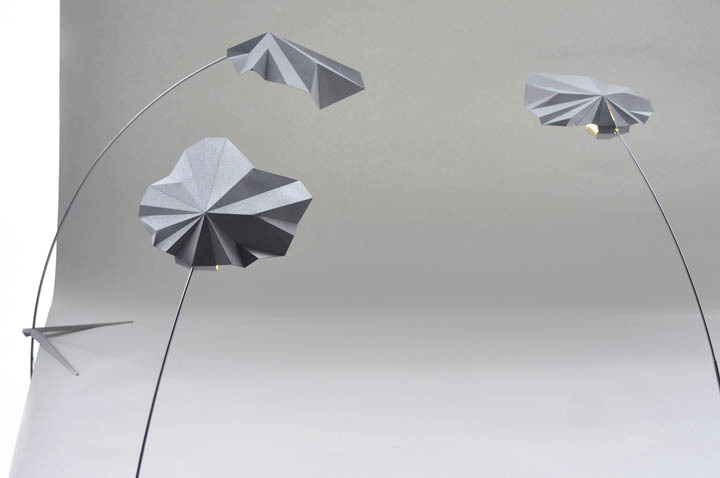 Flight of Objects - International designweek Milan, with Drift, Studio Molen and Sebastian Brajkovic. 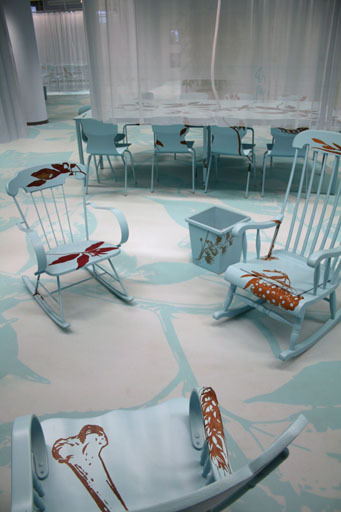 Salone del Mobile, Milan. 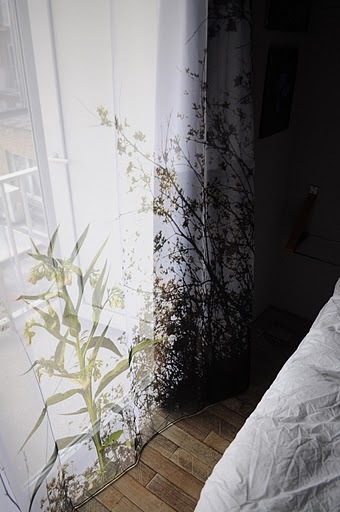 Deluge 3D curtains, self assembly DIY Led Leaf, our natural perfume 'Deluge', and Lucid Dream crystalglass LED lights. By turning round the order of the net and curtain a 3-dimensional effect is being introduced as a window darkening system. Especially for Salone del Mobile Designers of the unusual created a landscape titled Deluge consisting out of 2 layers of silk organza, confronting us with a reality that is either poetic as well as overwhelming and hits you right in the face. At a time where nature disasters are breaking records we cannot ignore that earths power is something we live with or once will become a part of. In times where the food and cosmetic industry is merely using synthetic components, we have to find a new balance in how we treat nature and ourselves. Deluge is based on local, natural and ecological ingredients. The bottle won't leak it's perfume, it only gives a drop when you shake, due to its capillary action. Handblown crystal-glass with high brightness LEDs. 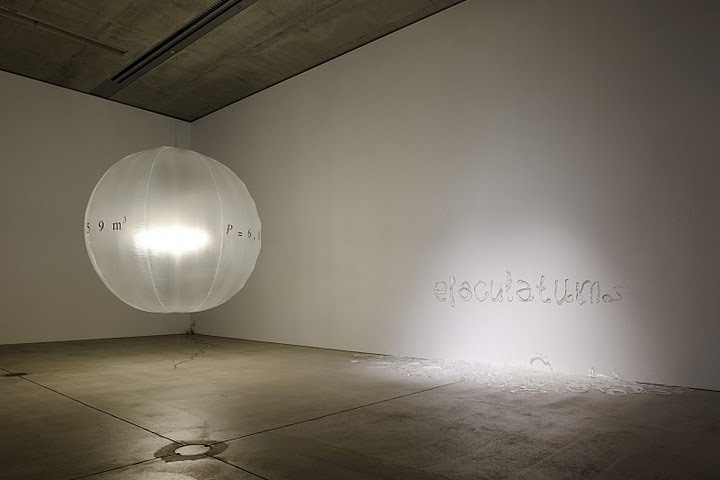 The lucid dream shows the ability of glass to transmit light by internal reflection, spreading light energy of LED's on an extreme efficient way throughout its complete surface, as an illuminating soap bubble. 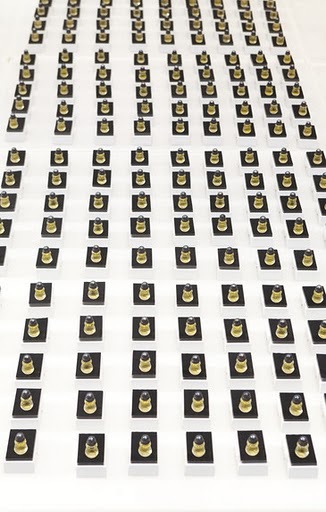 The Led Leaf is a one 5 Watts LED lighting system introducing durable and efficient LEDs with minimal material and low cost production methods in a do-it-yourself package. 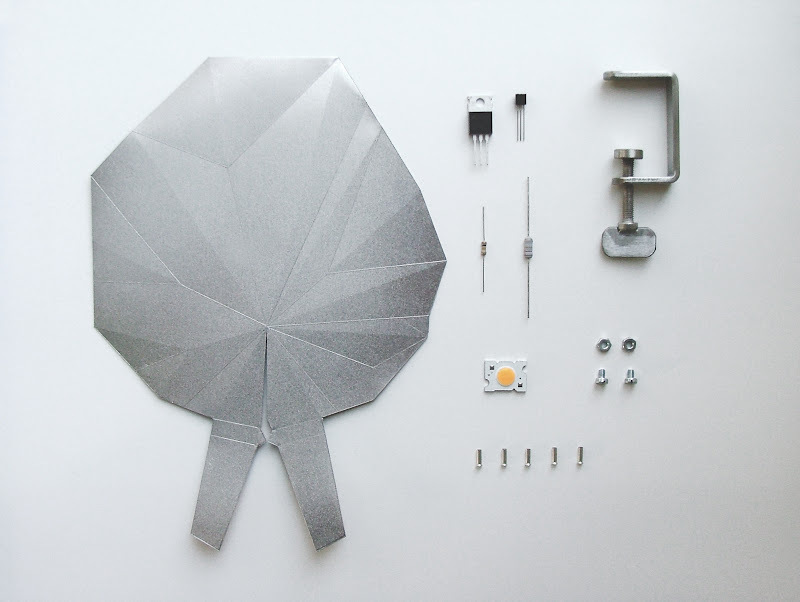 The leaf itself functions not only as a lampshade, but at the same time as a cooler for the high-efficient power LED. Curtains for private apartment in Belgium, which has been designed by Ooze Architects. 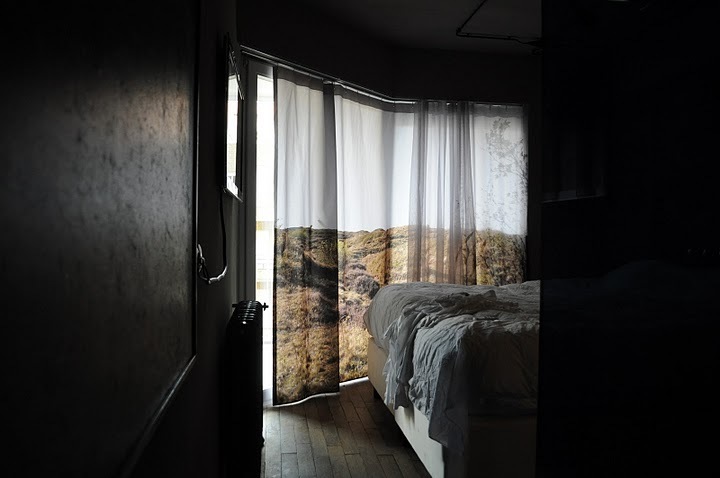 For an apartment at the seaside of Knokke, Belgium, we were asked to design curtains for the living and bedrooms. 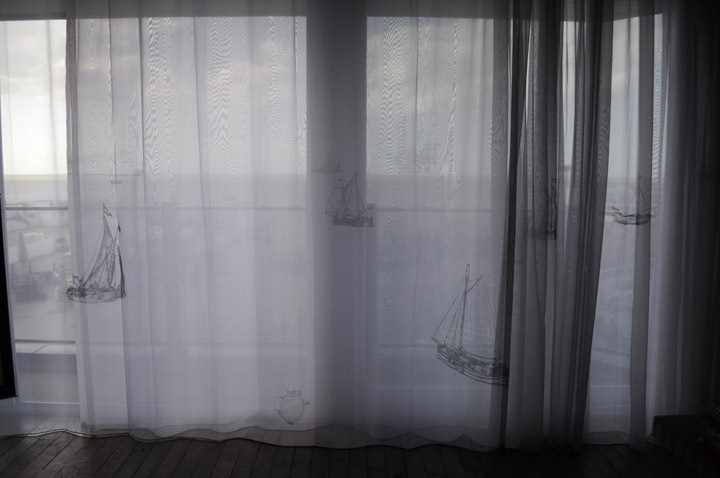 The living room has a view on the sea, and for this we created 3 layers of 'voile' curtains, working as a 3D panorama, with on every layer different boats in depth, drawn by Eric Klarenbeek. The backside view of he apartment is poor due to the facing housing block. Therefore we created two layers of curtains. 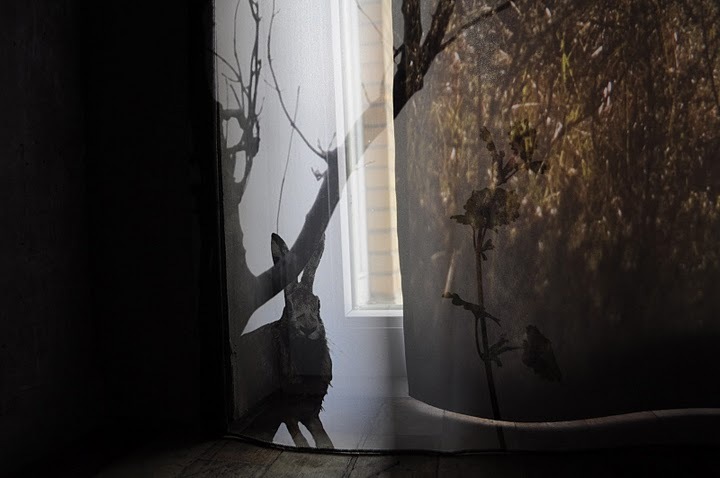 One thick light absorbing curtain, with the dutch dunes, and one layer of a thin voile, with plants and animals. Photographed by Eric Klarenbeek in the dutch dunes of the island Texel. Especially at night it's difficult to distinguish whether its real or virtual, giving you a feeling of being able to step out of your door, right in the fields. Contemporary art and design centre, an overview of new performative and process oriented experiments in contemporary design. Showing "Work-Survey" a movie about our work (9:36min). For the Fuori Salone during the Milan design week, we were invited to participate in 'Everything must go', reviving and transforming items lost to bankruptcies. For Droog Design we created a series of three perfumes; Miller, Flowergirl and The odd one out. The value of the salt shakers, found by Droog Design, was upgraded by turning it into a perfume. It is created with locally found ingredients, from a local distiller, a perfume maker and a windmill. For The London Design Festival we created a new generation of Lucid Dreams. During Experimenta at the Lapse in Time exhibition, Experimentadesign in Lisbon, we presented the process of the floating light project with a new piece Plié. As a mix between performance and product, we installed the presented works during the opening, starting with an empty space, which slowly converted into the exhibition space, working together with choreographer Nuno Almeida and his students from the dance academy of Lisbon. Here you can you the movie of the rehearsal. End of May we opened a horse route, interior, wand ropes and furniture for the Province Gelderland at Marienwaerdt. This together with 10 benches for to the formal Dutch defence line, De Nieuwe Hollandse Waterlinie. Above you can see 2 of the woven wand ropes, one of the dutch defense line, with the flooded area in darkblue and it's fortresses in gold. 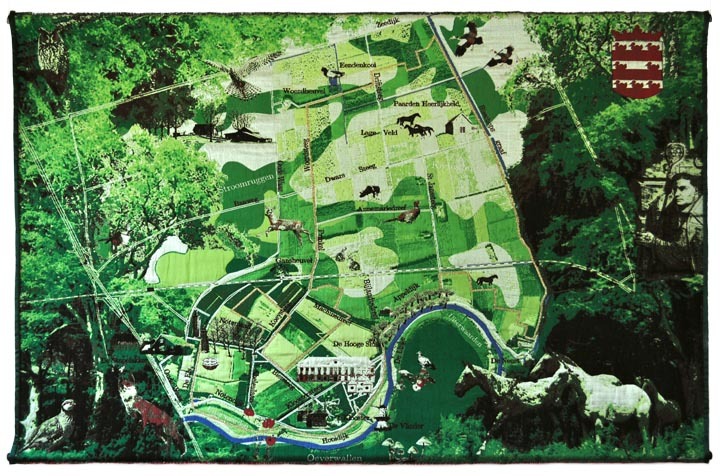 The other map is of Landgoed Marienwaërdt, with it's new horse route. The animals, trees and plants are actual living there and are photographed by us or from online location based inventories of local flora and fauna. Movie, co-directed by Efrem Stein. 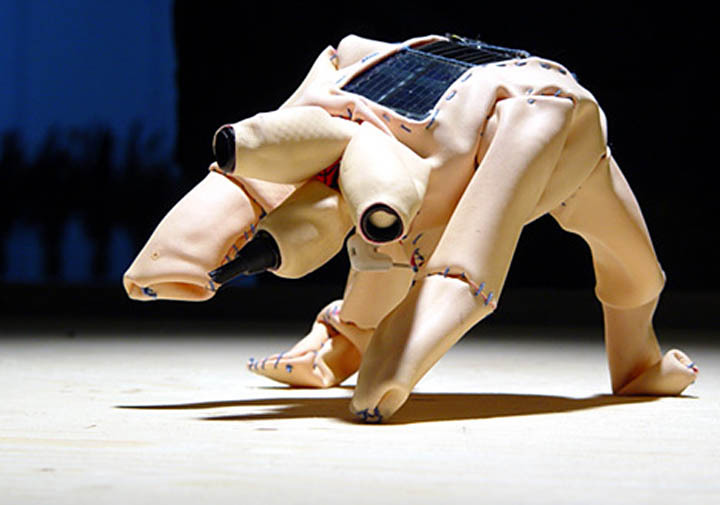 We started working together during his performance 'Opgezet', which was based on my animatronic cat Poekie. We thought it would be great to create something together, resulting in this movie. Many thanks to the performers who supported this project! Please take time to see it on youtube at high quality. This movie was first presented at the Wonder Room of Selfridges, London, UK together with three unique Eye Jewellery collector pieces. It's viewed over 250.000 times on youtube, and got published and broadcasted worldwide. It was published in the Times (2x), Indian Times, ABC, Der Spiegel and was nominated as Top Rated Fashion Trend by ITN and Asia Television, which has over 18 million viewers. Flexible workspaces at horeca and technical educational departments of the ROC Aventus in Apeldoorn. We recycled the old furniture and gave it a new live by repainting them. Through decoration you can see it's original skin and structure. For the floor I've experimented with textiles and casting methods, resulting in a textile print, embedded in a transparent casted floor. NAT Designing Nature. For this exhibition we created an solar powered light searching robot, saving his energy to burn dots during his journey. 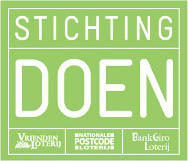 This to infect the other exhibited designs, which were created for this exhibition. He needed quite a lot of energy in order to walk, and save enough power to create a burning pattern, what made him pretty slow on interior lighting. One week was a bit short for our autonomous destroying robot, to really create serious damage. The fun thing was that the exhibitors covered him (and his solarcells) with a blanket every night, so he couldn't burn the whole place down. For the Dutch Waterline. A military defense line, covering the complete middle part of the Netherlands, our studio is selected to design the identity of the area, including it's furniture, fencing and lighting. Its main defense line counts 85 kilometers, running from Amsterdam till Rotterdam, its function was to protect the westside of the Netherlands. He're a preview of our first book. We're now working on the definite protoypes and catalogue, including its manual and technical drawings. 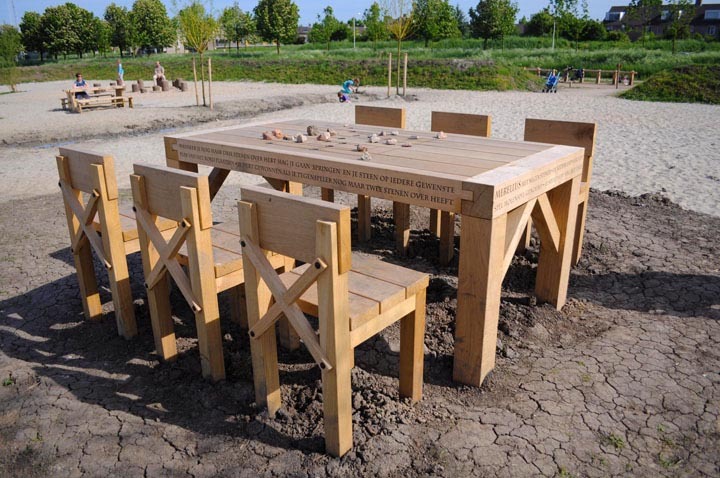 For a 'Speelbos', a playing forrest for children in Houten near Utrecht, The Netherlands, we created all objects and furniture. Based on it's cultural heritage, as the roman used to live in this area and built their Fectio fortress around 3AD. Nearly 2000 year later it became a strategic area for the Dutch Waterline (Nieuwe Hollandse Waterlinie) and once again they decided to build a fortress (1870) and found the roman settlement. We created a series of benches, travelling through wooden construction techniques and habits as through a timeline, each bench representing another era, from 0AD till present. Besides this we created granite navigation maps. Objects, such as an enlargement of a roman mask, which was found in the area. After we made a 3D scan of the original, we were able to enlarge it, resulting in a lower resolution version of the original mask (realised by Erick den Boer). Furthermore; a concrete periscope-house and shooting wall both based on the dutch waterline, and a reinterpretation of a middle age settlement also found during archaeological research. 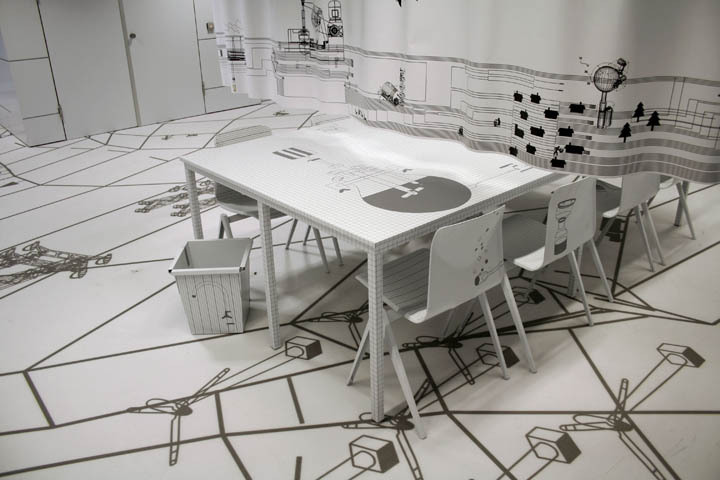 The designteam existed of Eric Klarenbeek, Maartje Dros & Sergio Davila. We're really proud to announce that Windlight is presented at the World Expo in China, Yeah! 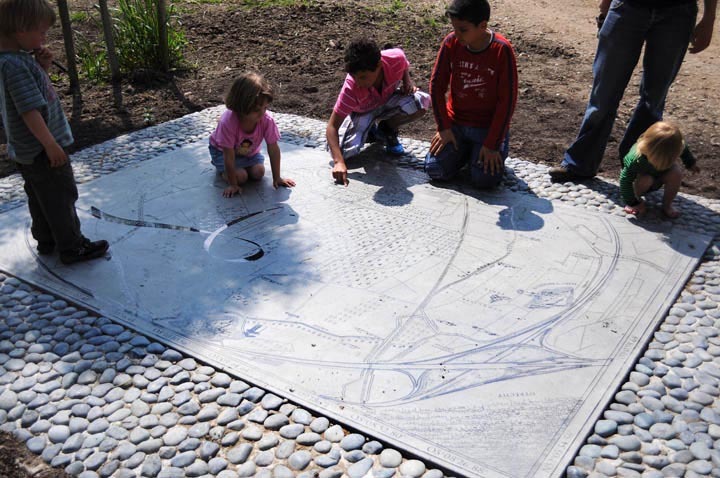 This on the Dutch pavilion "Happy Street" by Dutch Architect John Körmeling. 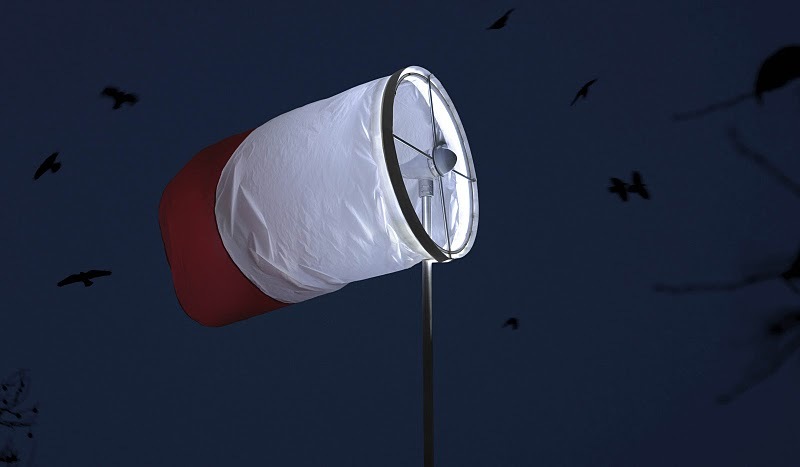 So last 6 months we developed it as a serious autonomous functioning wind powered LED streetlight, with a warm but high light output brought by 20Watt of LED's! Windlight started as an experimental proposal for city lighting in the Dutch city of Zaandam. 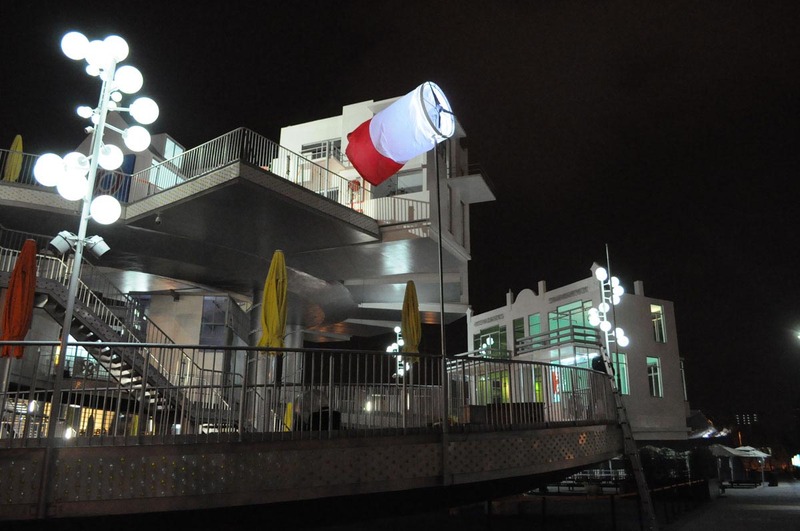 It brings a positive, happy atmosphere to areas that are demolished, abandoned or under development, where it serves as a temporary mobile tool for its transition period. Windlight is also a pure functional design. Near highways, on bridges and in open areas it lights up at night, to alert car drivers of sudden extreme winds. 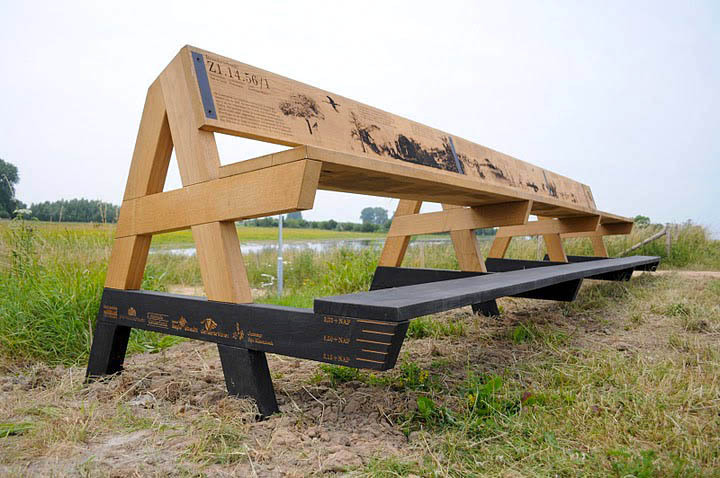 The waterline Bench indicates the water level of the Dutch Waterline, De Nieuwe Hollandse Waterlinie. A formal defense method in times of threat of the Netherlands, which split the Netherlands in two, running from North to South, to protect the west side of the Netherlands. Having operated for centuries, being a secret defense tool till the 50'ties of last century, the dutch were able to artificially flood big pieces of land. This with only around 30 cm of water, so you weren't able to see roads, holes, obstacles. It disabled militaries to cross this kilometres wide boarder, as it was to deep to walk through and too shallow for ships. With GPS, we measured the exact water height in case of flooding, resulting in this series of benches, varying from ground level height, to 1,40 meters, depending on the exact location. Windmills, multiculturalism, wooden houses, nature, harbours and polders. 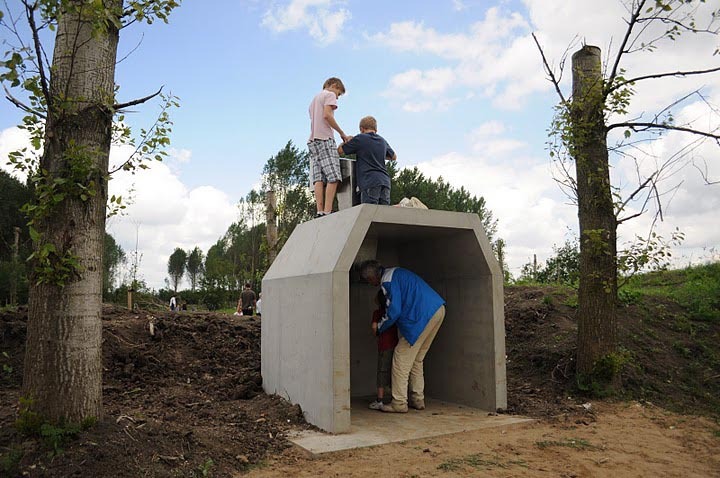 Over 700 local residents of Zaanstad participated in the tunnel design via our website. We've designed the 280m long pixelated walls of the Pixelpoort bicycle tunnel in Zaandam (NL) together with dutch designers Maartje Dros and Overtreders W. Via www.pixelpoort.nl people submitted images drawn pixel by pixel on the website, illustrating what they were most proud about in their region. 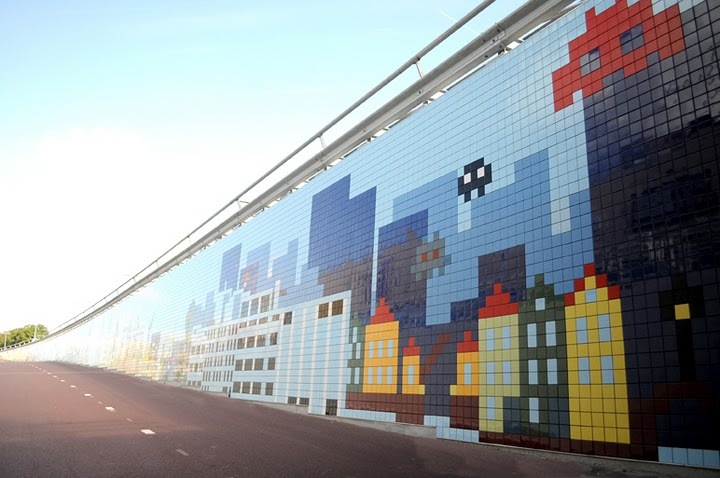 These pixels were translated into tiles, and is now realised in the 'bicycle gate' between Amsterdam and Zaandam. 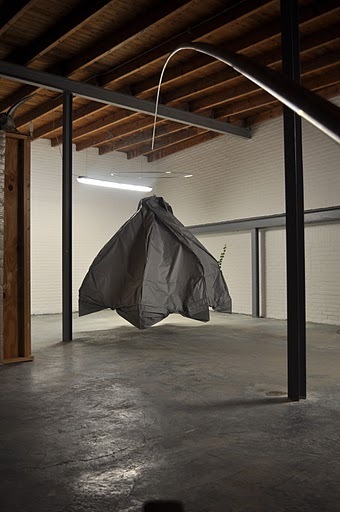 Studio Eric Klarenbeek does special projects, or let's say the unusual, for unusual people, projects or purposes. 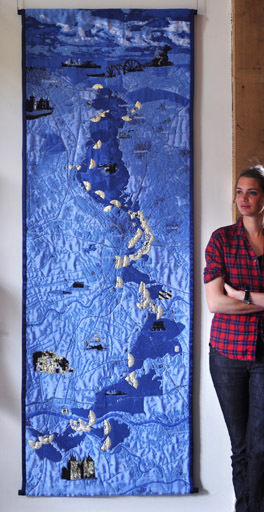 His studio connects creatives, designers, architects and local crafts. 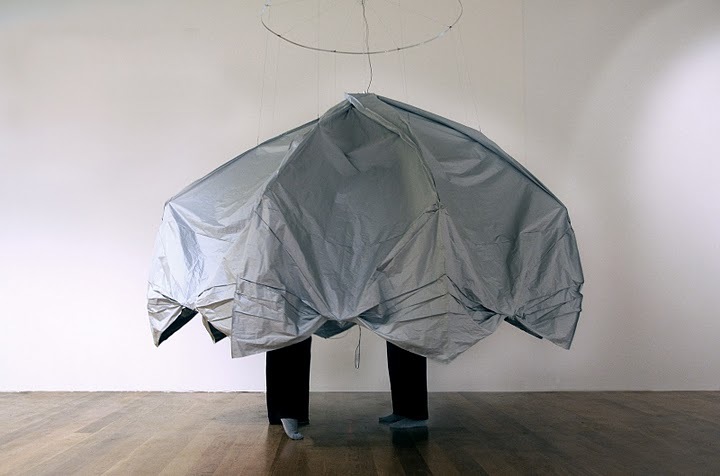 We search for new meaning and principles in technology, resources, objects and spaces, for unexplored connections between materials, production methods, makers and users. Scale and appliance are irrelevant. Eric Klarenbeek (Amsterdam 1978) graduated in 2003 at the Design Academy Eindhoven. 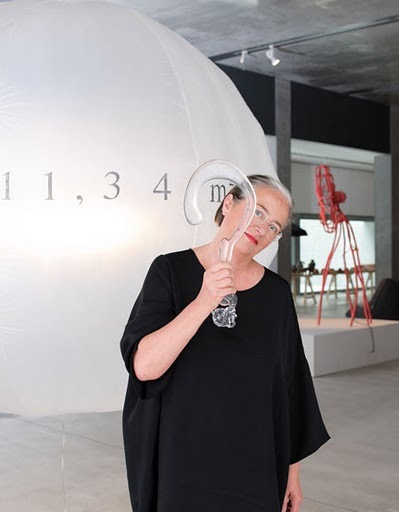 Since then he has designed for clients such as Droog Design, Marcel Wanders's Moooi, Lidewij Edelkoort, Makkink Bey, Eneco and the Ministry of the Netherlands. He is founder of the ArTechLab at the AKI ArtEZ art academy (www.artechlab.nl). His projects have been exhibited and published extensively. 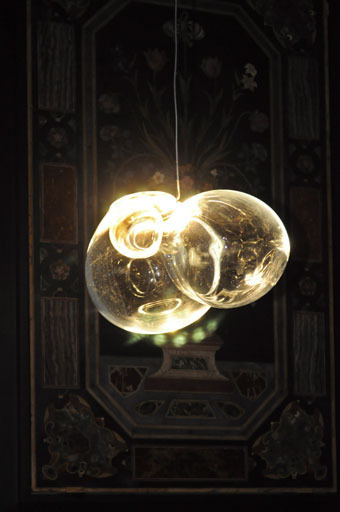 His windlight is presented at the World Expo 2010 in Shanghai and The Floating Light Project was awarded for innovative design at The Design Academy Eindhoven. 'My work is characterized by interaction and innovation. 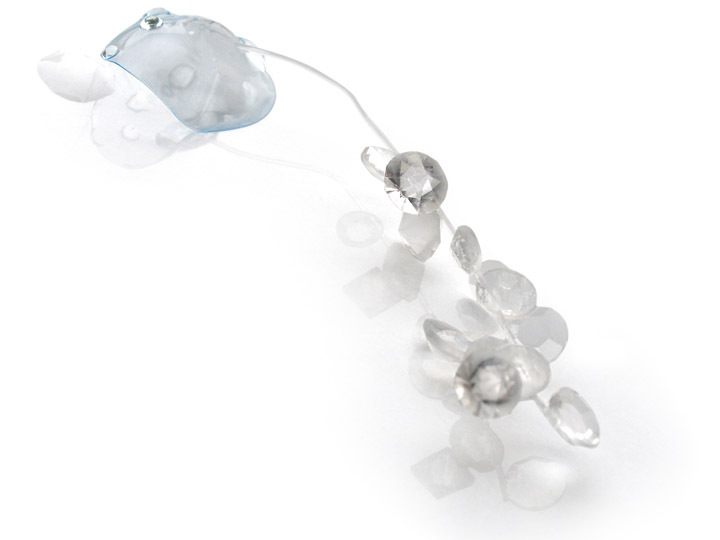 My products can be in motion, react on our emotions or respond on developments in our society. 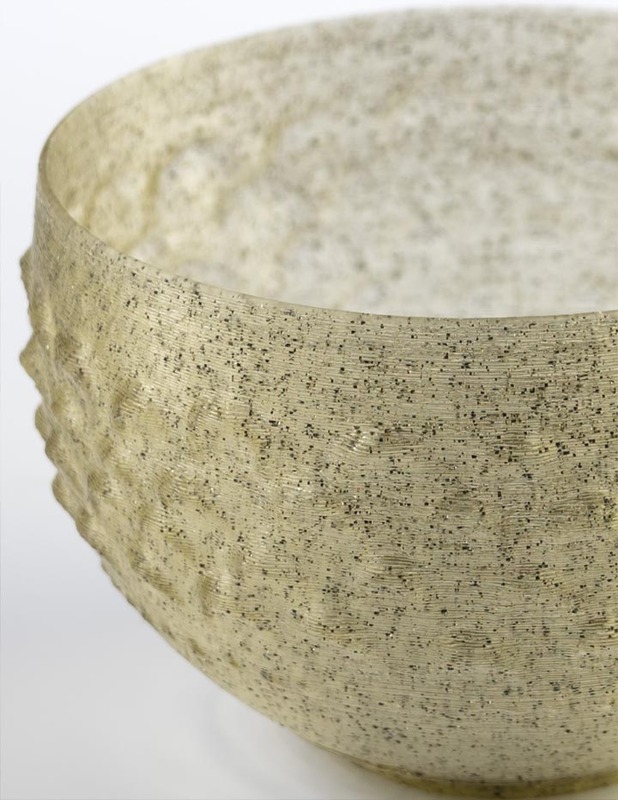 I search for new meaning and principles in objects, for unexplored connections between materials, production methods, makers and users. 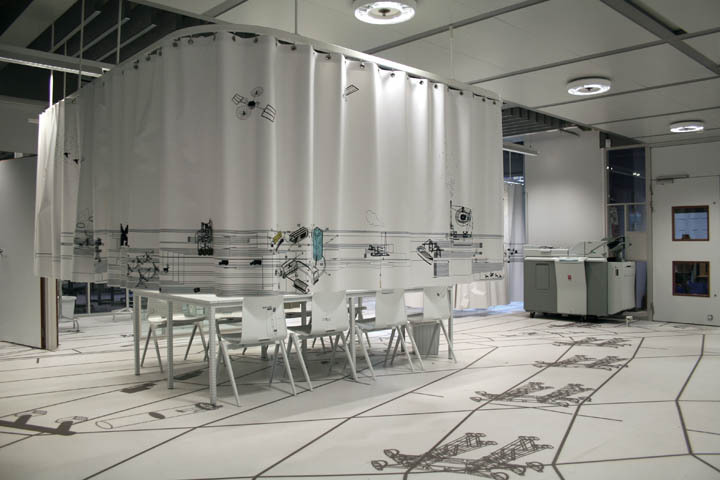 Every project is a research, resulting in interior and public space appliances and designs.' Eric Klarenbeek. He and Maartje were selected to design the public space furniture and identity of the New Dutch Waterline, commissioned by the Dutch Ministry for Infrastructure and Environment DLG. A formal defense line of around 85 kilometres, stretching from Amsterdam to Rotterdam, forming a protective ring around the western and economical part of the Netherlands. At the moment they're working on varying projects, such as the design of a formal Roman Castellum Fectio, established around 4 AD till around 300 AD, commissioned by the Province Utrecht http://publiekgemaakt.nl/castellum-fectio-historie-in-ontwikkeling/. 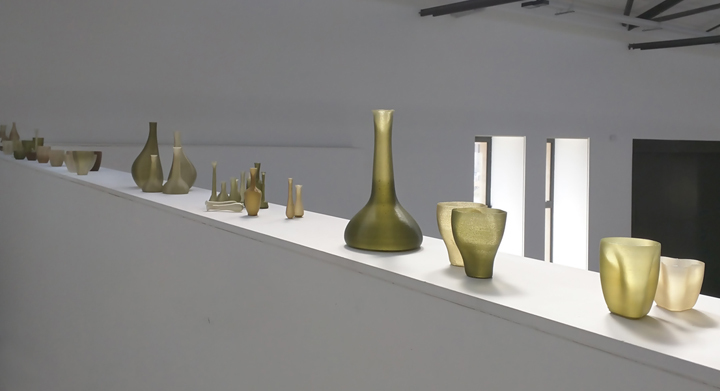 Wanda de Wit, Francois Lombarts, Jolien van Delft, Sergio Davila, Patricia Ferreira, Joslyn Sneddon, Famke van Bon, Jana Flohr, Frank Kolkman, Lisanne Jasperse, Jorine Idzinga, Arjen Schilder, Ellen Verbruggen, Iro Mazarati, Marian Lassak and Yingqi Long.